We've arrived in Labuan Bajo, on the Western tip of Flores, the start of Komodo country. We've almost run out of vegetables again and so need to head to the markets to re-stock. There are rumours of watermelons and mangoes... When I last wrote, we were in Wangi Wangi for Indonesian Independence Day. That didn't work out so well for the rally, with a small amount of 'social unrest' resulting in the celebrations being cancelled and the rally visitors being escorted back to their dinghies by armed guard! We had decided not to go, luckily. Nobody is quite sure what the protest was about but it appears to have had something to do with the local government having decided to host the event during Ramadam and before sunset – the local Muslim population were upset at food being served to Westerners and possibly also at government cash being spent on our entertainment rather than health and educational services for the local area. A fair point, really. Anyway, it left rather a sour taste and we all exited rather rapidly the next day. Nothing like an armed guard to dampen the holiday spirit. The last couple of weeks internet access has been non-existent, though strangely our Indonesian phone seems to work almost everywhere. For a country not big on infrastructure, Indonesia is very good at building mobile phone towers! We've been to some beautiful islands – with our last few days on Gili Bodo being probably at the top of the list. Gili Bodo has crystal clear water, good snorkelling, a white sandy beach and no inhabitants! Perfection. 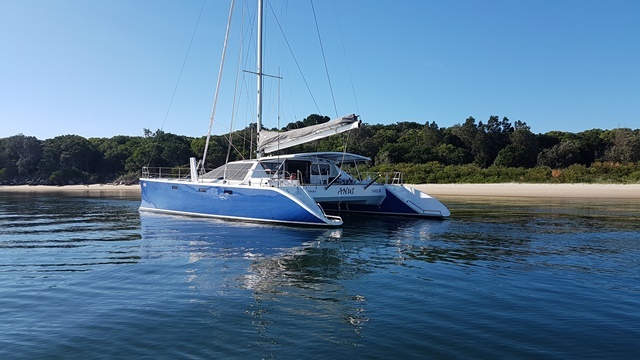 We were there with our friends from Red Boomer II and Suspence – 9 adults and 7 kids altogether – so had a fine run of fires on the beach, snorkelling parties, spear-fishing expeditions and sun-downers that continued long after the sun had gone. The kids kayaked and swam between each other's boats and Finn could not be kept out of the water – at last! We saw our first monkeys on the beach, but luckily they were small and shy ones. In case that all sounds a bit too idyllic, remember that we still have to fight over schoolwork, do the washing, cook the meals.... oh, and the bracket in the alternator broke again. Scott had to manufacture a new one, which he managed to do using alloy donated by helpful friends and the ancient tool bench of a large rock and hammer. We spent some days in the very pretty Inca village, which is split into two smaller settlements – one Muslim and one Catholic. The two belief systems seem to get on very well together and the people were, as everywhere, warm and friendly. We ate coconuts on the steps of the huge Catholic church and invited our nice guide and his friends over for coffee. It's strange, but in some villages we are constantly harassed by local boats to buy and donate – in a village called Lingeh recently the demands were so relentless that we eventually stayed inside until dark so that they would all go away! Mostly, though, people paddle their dug-out canoes to have a look at the boat and shout 'hello mister!' and are happy to chat and smile. The kids are generally happy with t-shirts and some school books or pens and they like capsizing their canoes and swimming near us. When we go into a village I carry lolly-pops and balloons in my bag for kids that we meet in the streets. We are always having babies thrust into our arms and our oohs and aahs are much appreciated. Here in Labuan we will look into the merits of the various Komodo and Rincha anchorages so that we can see some Komodo dragons and decide where to go next. Apparently there are some expectations about paying fees to even step onto the beach but we shall seek some local knowledge about where to go. Hopefully we won't be eaten. We have to be in Bali by the middle of September to renew our visas so that is our main deadline. In the meantime, we'll look for dragons and hope to see them for free and at a safe distance!